• Cost and availability of winter supplements. 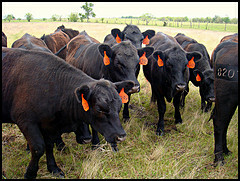 • Animal type (mature cows, replacement heifers or back-grounded calves). • Body condition of your cattle. • Calving date, if applicable. The Minnesota beef experts explain that generally, winter feeding can be accomplished with harvested forages such as hay and silage. Grazing crop residues can also be utilized, but may not always be feasible in areas that receive significant amounts of snowfall during early winter months. Cows can graze through up to 9 inches of snow to get high quality forages, but reduced forage intake will occur with as little as ¼ inch of ice covering the snow. Plus, cold temperatures and precipitation can decrease the feed’s nutritional value. Throughout the winter,it’s important to evaluate cow performance by observing body weight and condition Herd Health Program changes resulting from your feeding program. This will tell you if you are correctly supplementing your cattle through the winter and preparing those spring calving herds for the calving season. Contact us with questions and how we can help you get started with this program. This entry was posted on Thursday, April 26th, 2012 at 5:47 pm	and is filed under articles, Cattle. You can follow any responses to this entry through the RSS 2.0 feed. Responses are currently closed, but you can trackback from your own site.